Learn minor pentatonic and full 7-note scales across the neck used to create crafty leads. In the Rock House instructional DVD Leads & Riffs Creative Concepts for Metal, Michael "Padge" Paget, lead guitarist of Bullet For My Valentine, presents the elements of his aggressive lead style and the vibrating riffs he pounds out to inspire a new generation of guitarists. Use this DVD to learn minor pentatonic and full 7-note scales across the neck used to create crafty leads. See how Padge constructs many of his signature leads as he takes you step-by-step through "Tears Don't Fall," "Scream Aim Fire," "Eye of the Storm," and others. Includes e-Tab book and iPod-ready video featuring lessons. Paget demonstrates how to write melodic leads, how to improvise, and ways to develop your own guitar style. Paget explains how he applies bending, 3-string sweeps, tremolo picking, and hammer pull-offs to his guitar leads. The full-band backing tracks put you at the center of "Bullet For My Valentine's" earth-shattering sound. 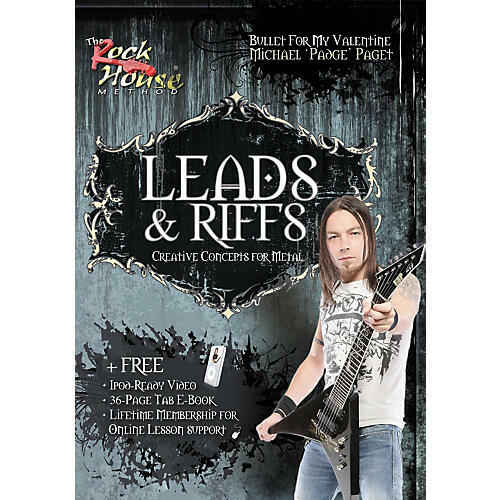 Like all Rock House videos, Leads & Riffs Creative Concepts for Metal includes a tab booklet in electronic format, iPod-ready video, and free lifetime membership to Rock House's online lesson support. Enhance your learning experience to links with instructors, download backing tracks, access message boards, and much more. You'll connect with a community of musicians around the world learning to play music using The Rock House Method.